The Dallas Stars are in tough with injuries at forward, entering the week with five injured at the position with the list growing to a potential seven during Monday’s practice. The latest injury to strike the team came after centre Jason Spezza left practice, with head coach Lindy Ruff saying that he’s a question mark for Tuesday’s game against the Winnipeg Jets. According to the Stars, Spezza suffered the undisclosed injury during Saturday’s 3-0 loss to the Columbus Blue Jackets. Forward Ales Hemsky is also out with a groin injury and will miss Tuesday’s game. He played against the Blue Jackets on Saturday, making his debut off the injured reserve list, but it now looks like he came back too soon. 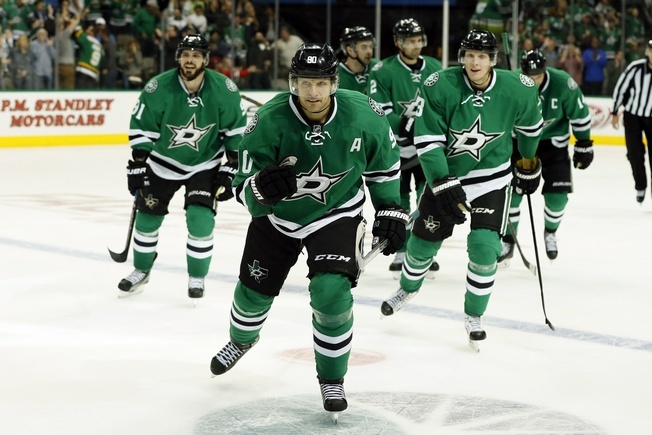 Along with Hemsky and Spezza, the Stars are missing forward Patrick Sharp (concussion), Patrick Eaves (lower body injury), Jiri Hudler (illness), Cody Eakin (knee), and Mattias Janmark (knee). Dallas will look to call up yet another player from the AHL, with Gemel Smith the latest arrival from Texas. The Stars have used 25 players in their first five regular season games, so that’s quite the rotation. Dallas is 2-2-1, good for fifth in the Central Division. They’ve scored just 14 goals so far and have allowed 16 goals against, so their struggles are apparent and this rash of injuries won’t help them find twine. Tyler Seguin leads the team in scoring with five points in five games, while Jamie Benn is second with four points in five games. After that it falls to 22-year-old Devin Shore, who also has four points in five games and has just eight games of NHL experience under his belt. The Stars must do some juggling along the way and should find a way to struggle through this adversity, as every game matters in their hard-hitting division. They’ve had trouble putting shots on target, plus they’ve allowed an average of 32.2 shots against. Some of that responsibility lies on the team’s young defence, but luckily the goaltending has pulled its proverbial weight. For now, Ruff and Co. must take things one day at a time. That can be tough when things seem to be falling apart at the seams and each day comes with a new injury to report.